Here is the way things stood in the mid-1880’s, when White Rock City was only starting to ebb, and the blockhouse known as "Fort Lookout" must have appeared much as it had when the Army built it, which may have been as late as Steptember of 1868. In fact, it had probably been put to use by James Battie as a farmhouse by 1884, the year a plat of the county was published. In 1903 the location is marked as the site of a dwelling on the Sweet farm, although pictures taken only a few years afterward (Available for viewing on kansasmemory.org), betray its ramshackle condition. It is marked as the location of the historic fort in a 1923 plat, when there must have been little left of it. A log from the blockhouse is preserved in the Republic County Historical Museum at Belleville. 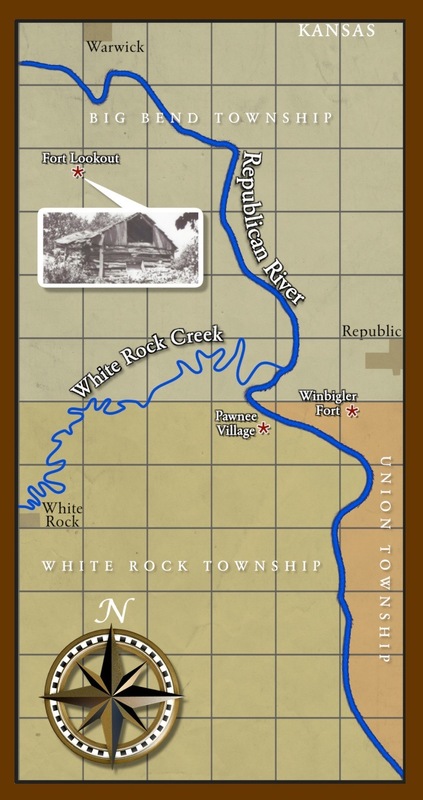 If Republic County historian Isaac Savage is correct about the location of another fort (And he precisely identifies the area where he was told it once stood), farmers cutting hay in 1868 sought refuge from a Cheyenne attack within the walls of a stockade that did not survive intact long enough to be noted on contemporary maps. A young ex-soldier named Gordon Winbigler died trying to reach it on or about August 15th. During the same wave of violence, Sarah Catherine White’s father was killed near Lake Sibley while she was taken into captivity.